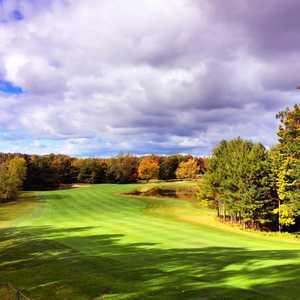 CEDAR, Mich. - The name of Arnold Palmer's King's Challenge Golf Club might have more to do with getting to the golf course than playing it. Playing Royal Dornoch's Carnegie Shield open will get you at least three rounds at a prestigious links course for less than the regular green fee. King's Challenge is located about a half hour northwest of Traverse City and about 10 minutes north of the booming metropolis of Cedar, which consists of a gas station, a general store, a stop sign and little else. The area, just minutes from the stunning Sleeping Bear Dunes National Lakeshore, is timeless and beautiful. You won't run into many traffic issues either - not since Sugarloaf Ski Resort, the area's main draw for many years, closed in 2000. King's Challenge and its neighboring course, Sleeping Bear, have felt the pinch since the resort closed; round demand has dropped 30 percent to 40 percent 2000. When King's Challenge opened in 1998, with the backing of Sugarloaf, rates at the course were $100. 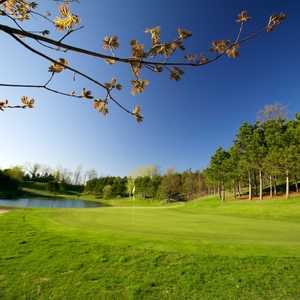 Today it only costs $80 to play in high season, and you can even cut a little off that if you get a package, either through the course or through the Traverse City Convention & Visitors Bureau. The claim in its name notwithstanding, Palmer's design is quite reasonable for players of all abilities. Probably the one thing holding King's Challenge back from being a top-echelon course for all players is it's length - less than 6,600 yards from the tips. Solid players are left hitting wedges and short irons to greens a little too often. Jack Nicklaus' The Bear down the road in Acme. Most greens are open in front for pitch-and-runs. Bad shots aren't penalized too severely in most instances, although there are a handful of water hazards on the course, coming into play on four holes. "Palmer courses in general are fair," Head Professional and General Manager Chuck Olson said. "What you see is what you get. We find, from the ladies' tees to the championship tees, [that] to be the case with players out here." The finest hole at King's Challenge, hands down, is the 8th, a difficult par 5 with gorgeous scenery to boot. Although the tee is generously elevated, the drive is difficult, with trees lining a crowned fairway, kicking balls towards trouble. The remainder of the hole wraps around a small pond that guards an even smaller green. "The shot over the water is often into the wind, on an angle, so it's difficult to get a good yardage," Olson said. "The difficulty on the 8th isn't just in the drive but the approach as well." Players also have a chance to flirt with a small, grassy runway from which small aircraft take off, which runs parallel to the par-5 5th. It may be the closest you'll ever get to a private plane. Fortunately the take-offs are neither very loud nor very frequent. King's Challenge is everything true northern Michigan golf should be. It's in the middle of nowhere and has spectacular scenery, good conditions and plenty of elevated tees. Strong players might wish for a little more length from the tips, and the course isn't quite the challenge the name promises. But it's well-conditioned and offers a diverse design with plenty of good driving holes and a healthy number of exciting shots. Stay-and-play packages are available, incorporating condominiums and townhouses at The Homestead, conveniently located adjacent to the King's Challenge and Sleeping Bear golf clubs. If you want to stay in downtown Traverse City, try the Bayshore Inn, which overlooks Grand Traverse Bay and qualifies you for package rates at King's Challenge and 14 other area courses. Upscale Trillium (800-236-1577) on the 16th and 17th floors of the Grand Traverse tower offers stunning views of the resort and surrounding area. The menu features regional American cuisine and the diverse wine list is nationally acclaimed, plus there's nightly live entertainment in the lounge. Bootlegger's (231-922-7742) on Union Street in downtown Traverse City is a good casual alternative, with a pub atmosphere and good specials, including a $9.99 NY Strip on Saturdays. The menu at 310 (231-932-1310) on Cass Street runs from sushi and wraps to burgers and salads; there's a small-plate menu for late noshing and a good selection of martinis. Mackinaw Brewing Co. (231-933-1100) has a wide choice of microbrews and keeps patrons around until closing time with a late-night happy hour. You've heard of "stay-and-play"; King's Challenge is known regionally for its "steak-and-play" package: 18 holes followed by dinner at the club's Steak-Haus restaurant.